With local elections due on June 5, and only a week away from the official start of the elections campaign, Bucharest inhabitants are faced with a never before seen decision: should a French business woman take the district mayor seat? When French Clotilde Armand, the general manager of Egis Romania, signed up to run for the mayor of Bucharest’s District 1, her four kids were upset that she’ll have less time for them. But she told them: "Don’t worry, everything will last only two months and things will be like before." But what if it lasts more than two months? Four years ago, Nicusor Dan, a mathematician and civil society activist, ran for the mayor of Bucharest. He managed to get about 8.5% of the votes, and that was it. So he understood that he needed to build a team for the next elections. This year, the time has come. He has created a party called The Union to Save Bucharest, and in March announced Clotilde Armand as their candidate for the District 1 mayor seat - the richest district in Bucharest. Her name was relatively unknown, except for those working in the business sector. Armand had been the Bucharest general director of Distrigaz Sud Retele, a subsidiary of GDF SUEZ between 2007 and 2010. She is currently the general director of Egis Romania, a French group offering consultancy on infrastructure projects. The first local reactions revolved around her citizenship. How come does a French citizen want to run in the local elections? Clotilde made clear in all her subsequent media interviews that she received the Romanian citizenship last year, that she loves the country and plans to stay here. Just like with any other task in school or at work, Clotilde Armand took her candidature very seriously. Running for mayor means hard work, responsibility ands good communication skills. She responded to all the press invitations and answered confidently to all the questions in Romanian - with a French accent. Armand’s popularity on Facebook went up in just over a month. Her page, created at the beginning of March, had 4,800 likes by mid-April. 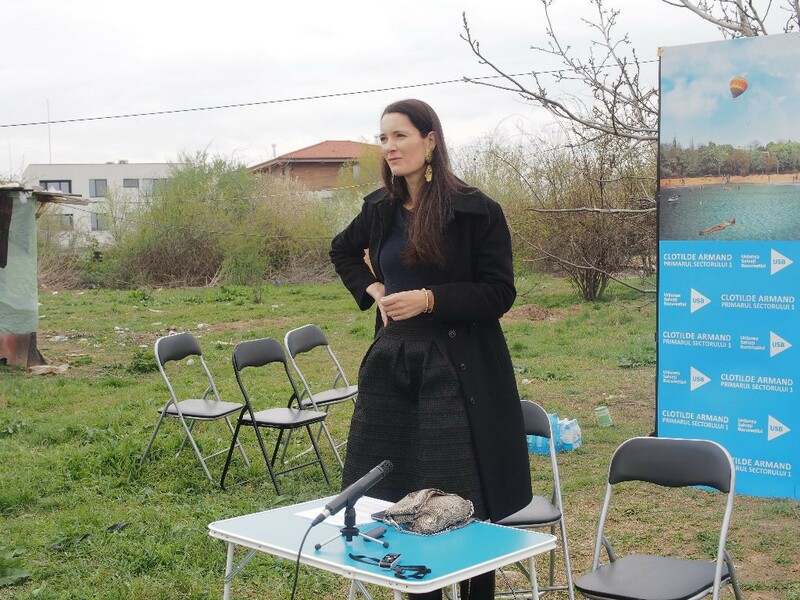 It’s March 29, and Clotilde Armand is about to launch her candidature for the mayor office in Bucharest’s District 1. Few days prior, she announced that she would choose a symbolic place. Prior to the event, she sent invitations to several media outlets, which included a map. The place was located between the Grivita and the Baneasa lakes, on the shore of one of the Baneasa lakes. No television crew showed up. “You can see here what needs to be saved in Bucharest,” Clotilde Armand starts her speech in a confident voice. She is very tall, has long, dark hair, a slim body, and wears massive Art Deco jewelry bought from a flea market. A dozen of journalists, members of her team and a poor family living in an improvised house on the lake’s shore have joined the conference. It’s the beginning of spring, so the smell of cherry blossom mixes with the lake’s heavy smell and a sweet, elegant perfume. “You can see in the middle of Bucharest a lake with dirty waters, abandoned shores and private properties that have occupied the public domain,” she goes on, with a militant voice. Clotilde Armand has chosen this symbolic place, because one of her main projects for the District 1 City Hall is to refurbish Bucharest’s northern lakes built in the 30s. Behind Clotilde, a board displays the image of an intense-blue lake, where a young girl swims, and several others boat. It seems like a fantasy, near the real grey lake only some meters away. She was shocked when she discovered that the city has a lot of lakes, but there are no beaches and places where you can take a bath. Bucharest’s inhabitants who are over 50 told her that they used to go to the beach on the shore of these lakes when they were young. So how come the waters have become dirty, dangerous and surrounded by illegally-built villas? “It’s easier to avoid mistakes when you remake something that was done well and worked for many years,” she says. Clotilde Armand decided to run for mayor when Nicusor Dan said that the Union to Save Bucharest needed candidates. She had known him for 20 years, as he was a good friend of Clotilde’s husband, the Romanian mathematician and researcher Sergiu Moroianu. Clotilde was an engineer who graduated from the Massachusetts Institute of Technology and quickly managed to build a career in the private sector. Politics hadn’t been on her agenda, until Nicusor launched the appeal. She said yes, without overthinking it. She felt it was her responsibility as a citizen to change how things in Bucharest’s public administration work, and she had the confidence she could actually do it. In the 12 years spent in Romania with her family, Clotilde has been asked several times about her opinion about Romania, and how she feels here. “I’ve felt that my answer matters and that I can play a good role. People suffer that Romania has a bad image, and I’ve noticed that I can help. I haven’t searched for this mission, it has been been somehow given to me,” Armand says. Some of the comments on her Facebook page pointed out that she has no real chance to win the office. But the woman sees it differently. She’s confident she’ll at least win a seat in the City Council, which requires at least 3% of the votes. This would give her access to the decisions that are made. “Rome wasn’t built in a single day,” she says. “Yes, but how?” the man insists. Despite the Romanians’ general lack of trust in the possibility to really combat corruption, Clotilde Armand is also perceived as an outsider. Not only is she a French citizen, but she is also a woman, and mostly, she lacks political connections. However, Armand defends her position. She is not a naive, and understands how public acquisitions work. From her position as general manager of Egis Romania, a company that has won public contracts for the design and consultancy of road infrastructure projects, she understands how the system works. Clotilde says that the consultancy and design segment, which is the first chain in the big infrastructure contracts, is not corrupt anymore, although it used to be 15 years ago. The real stake are the building contracts, which involve big money. The European Commission’s Country Report on Romania for 2015 shows that the corruption and fraud in public acquisitions remain a problem in Romania.